Halftime Magazine is proud to be celebrating its 5th anniversary in July 2012. Here’s a behind-the-scenes look at special moments in our history as well as the top stories and top covers. In 2007, I debuted Halftime Magazine at the Texas Bandmasters Association Convention/Clinic. Five years, 31 issues and hundreds of articles later, we are still marching on. Here, we celebrate and look back on five years of marching arts coverage. Halftime Magazine has become well-known not only in the marching arts community but has also been recognized as an expert source by the mainstream media. Deanna Colasurdo, a color guard member at Morristown (N.J.) High School, won a free screening of the film for her essay, “Bringing Music to Life,” which discussed how her participation in the pageantry arts helps her deaf father be able to see and feel the passion of music. In the last five years, a lot has changed in the marching arts. Throughout it all, Halftime Magazine has been there to provide you with the latest news, trend stories and lifestyle articles. Here are just a few of the highlights. Historic Moments: Halftime Magazine has been honored to exist during two of the most historic moments in recent history—the 2008 Summer Olympics and the inauguration of President Barack Obama in 2009. At the 2008 Summer Olympics, the country of China opened up its doors to the world and presented one of the most amazing Opening Ceremonies ever witnessed. China also invited a conglomerate of marching band members to participate in the international Olympic Orchestra, with 1,800 students performing at the Great Wall, Tiananmen Square and Tianjin. During Obama’s inauguration, 108 marching groups out of an applicant pool of 1,382 ensembles represented the 50 states of the union. 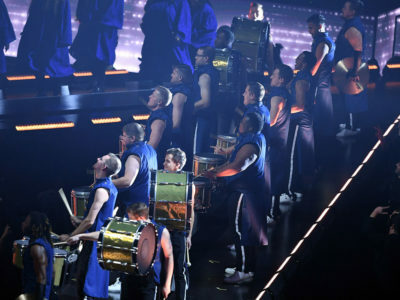 Visibility in Popular Culture: Throughout the past five years, marching groups have performed with rock bands at live concerts and music videos, in movies, in television shows and at the Superbowl. Because of these high-profile appearances, more people now recognize that marching band takes a lot of skill, athleticism and dedication, and the activity is seen as much “cooler” than it has been in the past. 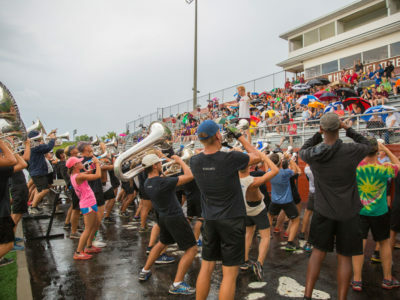 New Ensembles: Among the new marching groups that have formed, Music City Drum and Bugle Corps has made quite a name for itself, and many are anticipating the results of the inaugural year of Cadets2 in the all-age competition. On the college front, Georgia State University in Atlanta, Marian University from Indianapolis and Stevenson (Md.) University all had successful marching band debuts. Even Major League Soccer got a new band with the Sound Wave performing at Seattle Sounders FC games. But perhaps most importantly, the U.S. Army All-American Marching Band has given more than 600 high school seniors—and counting—a way to become recognized as All-Americans, just as important as their football player counterparts. 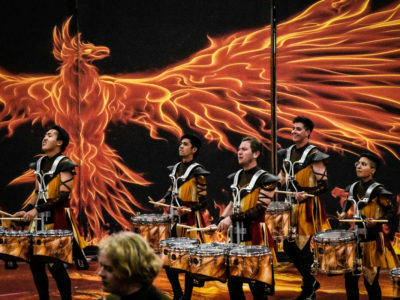 Competition Rules: Drum Corps International began allowing electronics—a controversial decision at the time—while WGI Sport of the Arts announced the use of lighting effects. College Football: In 2011, many universities announced transitions to different sports conferences in order to stay competitive. This year, representatives of the Bowl Championship Series stated that it will soon implement a four-team playoff. 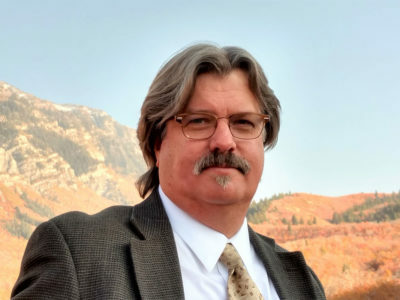 Key Personnel: Music for All (which had resulted as a merger between the Music for All Foundation and Bands of America in 2006) has seen a variety of changes in the executive lineup. 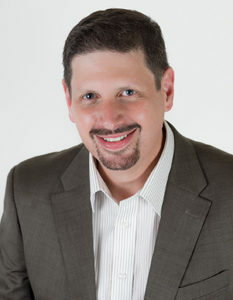 Bob Raddock, founder of Music for All Foundation resigned in 2009, followed shortly by CEO Scott McCormick in 2010. Key retirements include Ohio State University’s Dr. Jon R. Woods and Needham B. Broughton High School’s Jeffery “JR” Richardson. And there are those whose lives have been lost, including George N. Parks from the University of Massachusetts, Amherst. 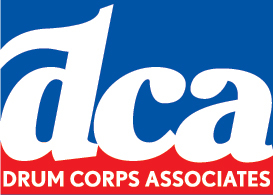 Organization Names: Two organizations involved in the marching arts made significant name changes to reflect changing times. 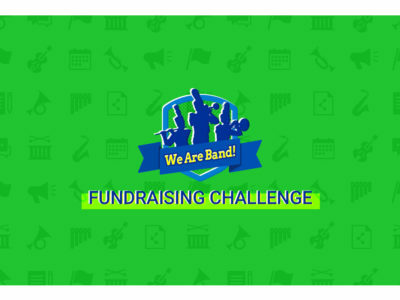 The U.S. Scholastic Band Association became USBands, and MENC became NAfME (the National Association for Music Education). But if we had to choose our own highlights reel, the following five stories stand out the most. In November 2011, the death of Florida A&M drum major Robert D. Champion, Jr., stunned the marching arts community— and the entire nation. Investigators found that he died as a result of severe hazing. Since then, 14 people have been charged with his death; band director Dr. Julian White retired; and the university suspended the marching band until spring 2013. While the story made widespread national news, we wanted to do more than just cover the facts. We wanted to have the opportunity to educate all organizations about how to stop hazing and to tell marching members how to say, “No.” So we spoke to national experts on hazing as well as college directors who have overcome hazing allegations in the past. We hope we made a difference in your program. With input from drum corps directors, instructors and fans, Halftime Magazine presented a countdown of the most legendary shows in Drum Corps International (DCI) history. This article sparked weeks of discussion on our own website, on Drum Corps Planet forums as well as on CNN.com, which recapped our story in a video segment. To this day, we still receive occasional comments about the piece. Many readers agreed with the picks while even more presented alternate choices. With so many wonderful DCI shows, it was hard to make a selection. So we were very happy to read all of the feedback and generate so much lively discussion. 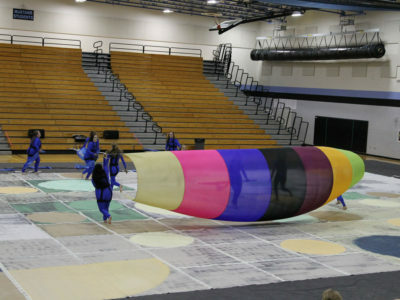 One of our contacts even asked us to consider a “Top 5 Legendary WGI Shows.” What do you think? In our premier issue of Halftime Magazine, we wanted to present a cross-section of topics, including something off the wall and funny. After all, many of our best marching memories come from inside jokes and crazy traditions. This particular story has a special place in my heart because I was able to showcase my alma mater, Northwestern University. For who else would use a toilet seat to display school spirit? This article, however, sparked controversy for the magazine because we also featured the Leland Stanford Junior University Marching Band (or Stanford University). Many people in the marching arts community find this scatter band’s spoof shows to be objectionable. I even had a web visitor refuse to subscribe for this reason. When Stanford appeared at the 2011 Orange Bowl, we again featured the group in our bowl game coverage. Stanford once again sparked an interesting controversy—though that time it was due to the lack of controversy. Mainstream media outlets assumed that Stanford was banned from participating in halftime though no such restriction existed. While we certainly don’t ever mean to offend anyone, we have always had the philosophy that every band, every corps, every guard and every drumline has a story. We showcase unbiased coverage of the good moments and the bad moments, the competitive groups and non-competitive groups, the big and the small. And one certainly cannot deny that the Stanford Band has some crazy traditions. Halftime Magazine always aims to provide informative stories that highlight a cross-section of experiences. I’ve heard many marching band directors and students tell me that they often operate in a silo. Therefore, the opportunity to learn about or watch other ensembles becomes an invaluable experience. 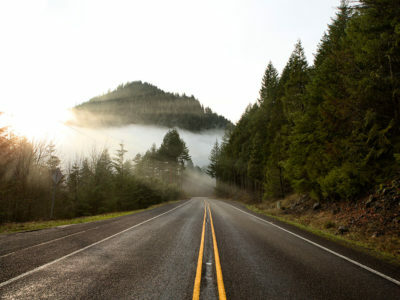 Many readers have cited “Band Camp Strategies” as this kind of educational story. In the piece, we looked at three different schools—West Orange (N.J.) High School; Marcus High School in Flower Mound, Texas; and South Brunswick High School in Monmouth Junction, N.J., that had vastly different methods of operating their band camps. The New Jersey groups start meeting for rehearsals in June while the state of Texas prohibits camp from starting earlier than August. 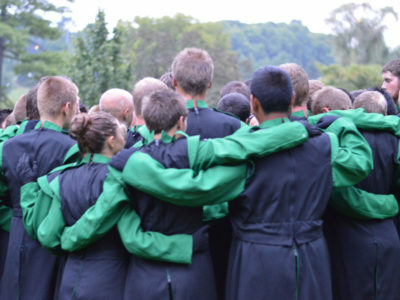 One group travels to an off-site location while two bands host camp at their schools. 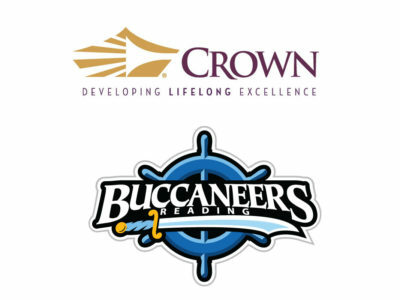 And two out of the three groups schedule recreational, team-building activities. 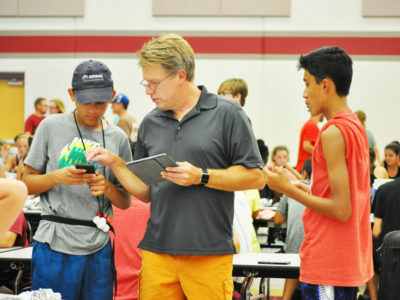 With the variance in band camp strategies, directors and students took this article as an opportunity to learn about other schools and apply those methods to their own. For five consecutive years, we have covered the Pasadena Tournament of Roses in a visual photo spread. With its worldwide viewership, the parade is undoubtedly one of the biggest honors for a marching band. It’s exhilarating to watch the floats and bands on New Year’s Day and to discuss the trivia. It also brings back great memories of when I marched there more than 15 years ago. We’re glad that our readers have enjoyed this series with us. The mission of Halftime Magazine has always been to educate, entertain and inspire. From the beginning, philanthropy has been one of our goals as well. That’s why our first year of Halftime Magazine included the essay contest, “Nominate Your Band.” Through that program, we provided more than $3,000 in cash and prizes— including equipment from Yamaha Corporation of America, Remo Inc. and Evans Drumheads/Rico Reeds—to winner Rachel Schaeffer and her band, the Old Bridge High School Marching Knights from Matawan, N.J.
More recently, we raised more than $2,000 in cash to help rebuild the Joplin (Mo.) Eagle Pride Band, whose high school was destroyed by a tornado in 2011. At the beginning of July 2012, we asked our Facebook fans and readers to vote for their favorite cover designs. Here are the winning covers. “The Commandant’s Own” U.S. Marine Drum and Bugle Corps supplied us with this image of its members performing at the Marine Corps War Memorial (Iwo Jima Monument). During the summer months, the group conducts Sunset Parades there every Tuesday evening. Not only is the image patriotic, but it also showcases the precision of the military ensembles with the members in perfect alignment. 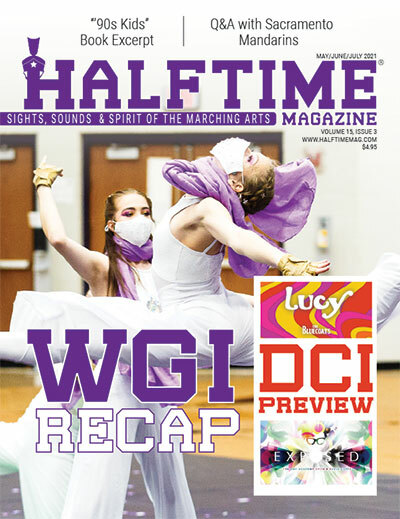 Though we didn’t know it at the time, this cover featuring guard members from the West Johnston High School Marching Band in Benson, N.C., would coincide with the winter guard’s 2010 WGI Scholastic Open Championship. The band has also been a strong contender in Bands of America and performed at the Macy’s Thanksgiving Day Parade in 2008. This image of the Phantom Regiment Drum and Bugle Corps was featured on our debut issue. It shows raw emotion as well as the hard work and sweat that go into a drum corps show. Due to Phantom Regiment’s low shakos, we were never able to identify the person behind the cover, but somehow the mystery made the image even more alluring. By an overwhelming response, fans “liked” the January/February 2008 cover featuring the University of Southern California Trojan Marching Band. Directed by Dr. Arthur C. Bartner for more than 40 years, the Trojan Marching Band has appeared in the Rose Bowl more than 33 times and has countless other guest appearances in movies, television and around the world.